As I got to the (current, as of 8 January 2010) end of this thread http://forum.m1911.org/showthread.php?t=77063 , I couldn't help but agree with the statement that things would be a lot easier if we had the length of the bullets available to us. I recently read a comment by someone (I don't recall which thread it was in) to the effect that he started loading to the same overall length as Winchester USA. In fact, that's exactly what I did. My first 100 rounds were loaded using once-fired Winchester brass, Winchester primers, Winchester 231 powder, and Winchester 230-grain FMJ bullets I found on a back shelf at the range store. So matching the overall length of Winchester factory ammo seemed to be a no-brainer. After that first 100 rounds, however, I changed over to using Berrys plated lead bullets, because they were (and are) significantly less expensive than "brand name" FMJ bullets. The bullet shape appeared the same as for the Winchester bullets, so I used the same COAL. And, as I have commented in a couple of other threads, the resultant velocities at what some books consider near-maximum charge are VERY much slower than should be expected -- like 100 f.p.s. or more slower than expected. Why don't we compile it ourselves? If everyone would measure up the bullets they're currently loading and post the information, someone (and I guess that means me) can compile it into a table that we can run as a sticky in the "Ammo & Reloading" forum area. Anyone loading lighter weights that have hollow bases should not that, because a hollow base effectively increases the case volume. I'm not sure how to treat those, other than to be sure we recognize them when they occur. As more data are submitted, we'll periodically update the spreadsheet so please keep those cards and letters coming in. Last edited by Hawkmoon; 25th February 2011 at 11:08. Last edited by Hawkmoon; 8th January 2010 at 17:43. 1. Although it's clear from your example in Post #2, it might be a good idea change the third item in Post #1 to "Bullet weight in grains (nominal weight advertised by mfr - not what you weighed it to be)". That'll avoid possible confusion caused by the slight weight variation (perhaps ± 1.5%, the SAAMI standard) were somebody to provide data on a, say, Hornady 187gn JSWC - instead of a 185gn bullet. 2. Same idea for the bullet OD: probably be best to specify the measurment technique, as you did in Post #2. However, if the manufacturer does not provide any COAL info, the COAL, seating depth and bullet exposure can only be estimated after some rather tedious measurements of the bullet - to find its nose length and body length. Sounds like a very worthwhile project. P.S. : How about data on bullets cast by Forum members? And after all that stuff, above, here's something useful! 1. Hornady #45137 185gn JSWC "TAR" Encapsulated: bullet length = 0.520 to 0.521"; OD = 0.4505". 2. Hornady #45177 230gn JRN, Encapsulated, bullet length = 0.643", OD = 0.4505 to 0.4507". Don't have any Hornady load data from which to find their recommended COAL's, but I do have measurements of body lengths, nose lengths, and my estimated COAL's for these. My estimated COAL's are found from: COAL = (Case Length) + (Nose Length) + (0.030" - for SWC's only). They are: 1.151" for the 185gn SWC and 1.256" for the 230gn JRN. Last edited by niemi24s; 8th January 2010 at 19:38. 1. Lyman #452460, 200gn LSWC, Lyman COAL = 1.161", Lyman Case Length = 0.888", Bullet Length = 0.602", Nose Length = 0.267", Body Length = 0.335". 2. SAECO #69, 200gn LSWC, Bullet Length = 0.631", Nose Length = 0.326", Body Length = 0.303". 3. H&G #68, flat base 200gn LSWC, Bullet Length = 0.639", Nose Length = 0.343", Body Length = 0.296". 4. H&G #358, 155gn LSWC, Bullet Length = 0.575", Nose Length = 0.344", Body Length = 0.231". 5. SAECO #130, 185gn LSWC, Bullet Length = 0.561", Nose Length = 0.241", Body Length = 0.320". All weights are the nominal weights advertised by the mold manufacturer. OD's not given as this depends on the sizer/lubricator die used. The blue outline is for 230gn JRN, GI Ball. Here's info on the bullet in GI Ball ammunition. The measurements were taken from 5 pulls from FC 65 headstamped rounds. Being pulls, the OD may be a wee bit less than it was before being loaded, but based on some other work the difference is probably less than 0.0001". 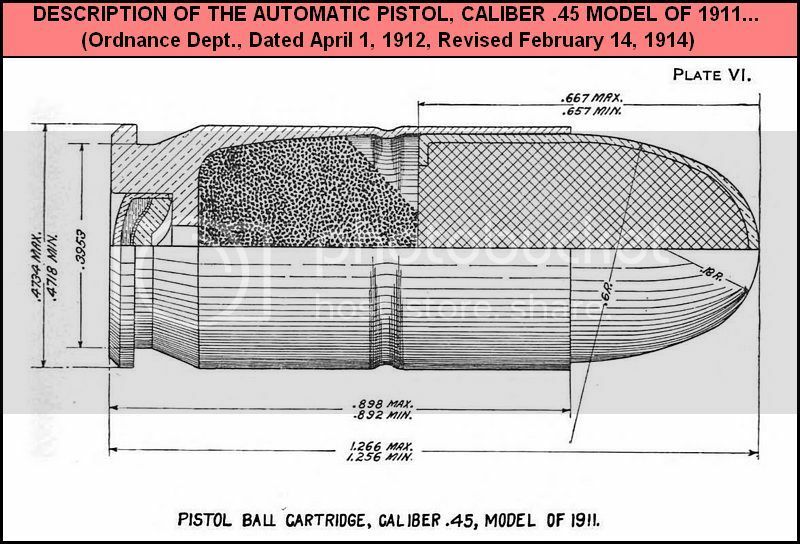 U.S. Gov't Issue GI Ball, 230gn JRN: Average Weight = 231.9gn, OD At Base = 0.4497 to 0.4502", Bullet Length = 0.674", Nose Length (Calculated) = 0.370", Body Length (calculated) = 0.304". The only official reference I've ever seen giving the bullet's length (0.68") is the Army's TM 43-0001-27. The lengths given in the pic, above, appear to be for the original version of the cartridge as they're too small. Thought this info might come in handy even though you can't get genuine 230gn GI Ball bullets as new components. I think it's the original 230gn JRN. Last edited by niemi24s; 11th January 2010 at 08:37.